Worldwide spending on public cloud services is set to reach USD 122.5 billion in 2017, an increase of 24.4 percent over 20161. In fact, the compound annual growth rate (CAGR) of spending on public cloud services is almost seven times that of overall IT spending growth and IDC predicts that by 2020, it will top USD 203.4 billion worldwide2. The size of the opportunity for cloud service providers (CSPs) is huge but fierce competition, accelerating innovation and the need to keep prices low continue to create enormous pressure. 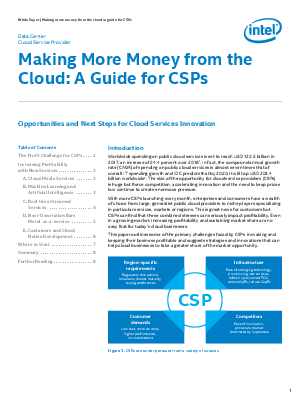 This paper outlines some of the primary challenges faced by CSPs in making and keeping their business profitable and suggests strategies and innovations that can help cloud businesses to take a greater share of the market opportunity.